The Town of Sharon (originally called New Dorlach) has lived with a dual identity for two centuries, home both to families with agricultural and rural roots, and to visitors and proprietors with visions of resorts and spas. Sharon is one of six original towns to form Schoharie County in 1797. Sharon’s dual identity is also about ethnicity and social tradition. Native Americans were lured here by the healing qualities of the sulphur, magnesia and chalybeate springs. 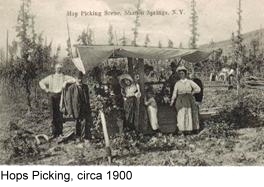 In the 18th century, Yankee settlers, primarily of German and Dutch background, intermingled with Native American tribes. After the Revolutionary War, migrants from New England and the Middle Atlantic followed. Sharon Spring’s development as a mineral water spa reputedly began when David Eldredge established a boarding house near the springs in 1825. Between 1836 and 1860, several large hotels and boarding houses were built to accommodate the increasing number of visitors. By 1841, the village had become world famous as the social elite came to take the waters. Magnificent large hotels and forest-like parks graced the village landscape. During the second half of the 19th Century, Sharon Springs was home to over sixty hotels and rooming houses accommodating over 10,000 visitors each summer. By the early 1900s, Sharon’s indigenous Christian mix had become distanced from the summer clientele with the influx of European visitors, primarily from Judaic tradition. More than any other factor, transportation directed Sharon’s economy. In the 1800s, two new turnpikes – Loonenbergh, which connected Sharon south to Athens on the Hudson, and the Great Western, which connected Sharon east to Albany competed with an amazingly, technologically superior canal system. With the turnpikes and canals, New Dorlach’s residents were no longer solely dealing with small, local markets; their goods could now be transferred through middlemen to cities like New York. As farmers converted from subsistence farming to cash crops, such as wheat and hops, Sharon’s economic perspective began to change. 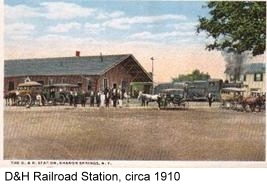 Then about forty years after the Erie Canal opened, the Delaware and Hudson railroad opened a spur through Sharon, and the age of the spa was fully born. The resources that led to Sharon’s success also contributed to its demise. The turnover of spa owners, owing to age, financial troubles, and a series of disastrous fires, meant the new proprietors were not as tied to the town. Other factors that led to an inevitable decline were of national scale.The hops market failed when Prohibition was introduced in the 1920s and the Bank Moratorium brought financial ruin to many local residents during the early years of the Depression. Passenger service on the D & H railroad ended in 1932, severing the artery which carried the lifeblood of the resorts. Soon after Prohibition ended in 1934 and the Depression had ruined the finances of clientele, owners, and local residents, once again a new form of transportation, the automobile, transformed Sharon’s character.The automobile may have been the biggest factor that brought the glory days of Sharon to an end. 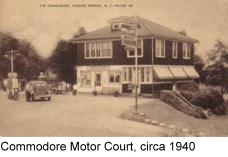 New types of accommodations, motels and motor courts, such as the Commodore, Davis Cabins and Eigen’s Point, appeared along the new route. These establishments catered to the automobile culture, emphasizing independent travel and do it yourself convenience, a far cry from the all-inclusive services of hotels like the Pavilion.The resorts and tourism industry in Sharon received a severe blow when in 1954 the New York State Thruway opened its new section from Utica to Newburgh and traffic on Route 20 decreased drastically. A positive development occurred in 1994 when the Sharon Historical Society obtained a grant for historical recognition of the spa area. 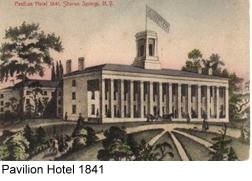 Approximately 180 buildings, including bathhouses, hotels, and homes, dating from the mid-19th and early-20th Century were surveyed and granted recognition as an Historic District and placed on New York State’s Register of Historic Places and also the National Register.Efforts to protect the unique architecture and character of the district, while providing opportunity for businesses to develop, is currently being undertaken. Throughout Sharon’s history, the town has weathered many changes and seen many economic recessions and recoveries.Just as Sharon’s men and women in 1820, watching David Eldredge build a rooming house near the springs, could not fathom that tens of thousands of visitors would flock here, perhaps we cannot envision the challenges and changes that loom ahead.